Replacing old, ungrounded wiring. Problem is cinder block walls. Inside, the exterior walls have rigid insulation and one layer of 1 x 3 furring strips covered by drywall. Interior walls have simply drywall directly on cider block. Aesthetically, I want to 'hide' all wires. There is no room for wires in the walls. We don't want surface raceway or conduit. Can either armored or plain wires be run behind baseboards? What if the baseboard is backed by 1/16" metal plating? Also can armored cable be routed thru ceiling joists? Or any other ideas and solutions welcome. What will meet NEC? Thanks! NEC 300.4(D) covers the type of installation indicated in the question, and it applies to both AC and MC armored cable. So you'll need to use a steel guard at least 1/16" thick to protect the cable. 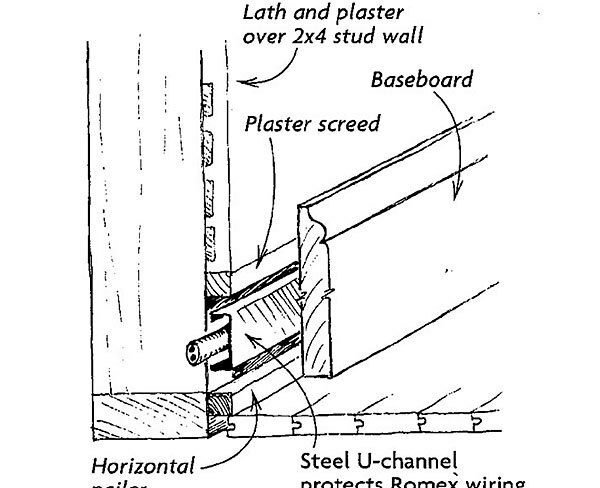 The illustration shows a nonmetallic cable and a plaster finished wall. You will need more depth than the thickness of the drywall to fit armored cable and steel U-channel. On your outside walls with the furring strip, you can just cut out the foam board with a knife and the furring strips with an oscillating tool to get the additional depth. On the interior walls, with the drywall directly on the block, I think you'll have to route a channel on the back of the base molding to make room. In fact it might be better to use that method on the outside walls, too. You have another challenge here: getting the cable from the baseboard channel to the existing boxes. This might not be too difficult if you can fish the void in the blocks, but it could be a big can of worms. You can retrofit just ground. Really. The biggest misconception is that you must replace all the wires. Nope! NEC has allowed you to retrofit grounds on feeders and larger circuits for awhile, and it worked so well that in NEC 2014 they threw it open to all circuits. This is an exception because ground is special. Normally, it's a fixed rule that currents must be equal in each cable or conduit. This is AC power and loops make inductors. This rule is enforced by a strict "tree" topology for cabling and conduit work, with no branch-branch crossovers. Retrofit grounds can follow any practical route, so that would seem to violate this rule. It doesn't, though, because the rule applies to active conductors - wires in which current normally flows. Ground only handles current during fault conditions. It's possible your jurisdiction hasn't adopted NEC 2014 yet because it also requires GFCI and AFCI on almost every circuit, and that's widely seen a bit harsh. But these ground rules are something NEC has been building to for quite awhile, so they're not a surprise - and I doubt anyone would get written up for following the next codebook. Read the ground retrofit rules, but the gist is that you can use any wiring route, no need to stay with the original route, and circuits can share grounds. The ground wire must be the appropriate width all the way back to the panel the circuit is served out of. For instance, if you are trying to ground a 30A dryer circuit, you need #10 ground wire, so the #12 ground wire going to the washer is not enough. However, if you are grounding a 50A range, that also specifies a #10 ground, so it can share the #10 ground you just fit on the dryer. directly onto one of the Grounding Electrode System wires, those thick bare wires that go from the panel to the ground rod or water pipe connection. You would tie on with a "split bolt". directly to another circuit's bare (retrofitted) ground wires, again via split bolt. You cannot cut into a cable to access its ground wire. The usual threat is arcing, which causes overheating and fire. That is a serious risk, but AFCI (Arc Fault) breakers are an effective solution. Some houses are wired with individual wires in steel conduit. This will have metal junction boxes, and wire colors that match the wire's purpose - not always the black, white, (red) found in cables. These do not require separate ground wires, the steel conduit is the ground "wire". Believe me, I have put this to the test, and it works. The only issue is that if you have a receptacle or lamp, it cannot rely on the yoke and mounting screws to carry ground current, unless the clean metal yoke bottoms out hard on a clean metal junction box. Typically the wall surface will be "proud" of the junction box, and when you tighten the screws, the drywall ears will hit the drywall before the yoke has bottomed. Stop there. That's what drywall ears are for. This means you will need a metal spacer to continue the ground, or most people just run a ground wire from the receptacle to the steel box. Most boxes have a hole in the back tapped #10-32 specifically for ground screws. They sell adorable litle green 10-32 screws just for this purpose, with or without pre-attached pigtails. (Any 10-32 machine screw will do). Don't use a self-tapping screw of your own, unless it is -32 or finer thread. It needs to be 6- or larger. With metal conduit, if you are unhappy with the age of the wire, just pull it out and install new wire. You can use the old wire to pull the new wire. If the pull force is excessive, there's a junction box or access point in between: find it. It's illegal to drywall over access points, but sometimes people do. Not the answer you're looking for? Browse other questions tagged electrical wiring baseboard nec basement-refinishing or ask your own question. How do I install baseboards behind bifold closet doors? Can Armored Cable and Nonmetallic sheathed cable be used together? Is Armored (BX) cable considered to be protected from damage? run data cable for outlet inside box?